Hello, inspy romance fans. 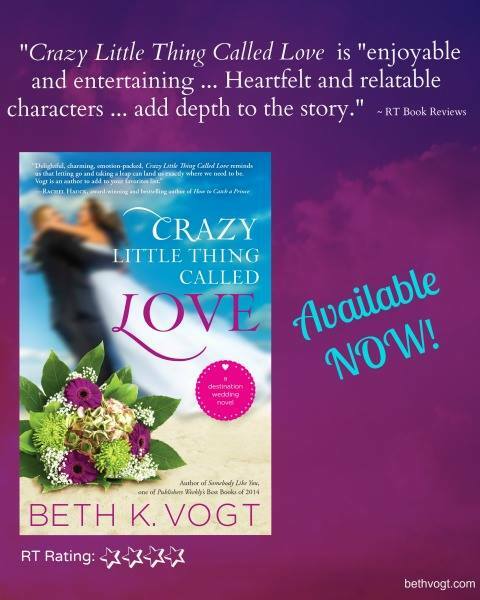 Have you had a chance to read Beth Vogt’s new release? Crazy Little Thing Called Love is one for the keeper shelf, in my opinion. There’s much to ponder about this novel, but I’d have to say my favorite aspect of Beth’s work is her ability to dig into the messy business of life and examine it through the lens of relatable characters. Who hasn’t wanted a second chance at restoring a broken relationship or an opportunity to right past wrongs? I’ll share more of my thoughts later on in the post. You might want to check out the details below about an opportunity to enter Beth’s Beach Bag Giveaway. Heidi’s Review: This poignant inspirational romance examines the age-old question of whether or not we can truly have a second chance at love. On a deeper level, the characters wrestle with the messiness of lives and reaping the consequences of an impulsive yet life-changing decision to marry young. Beth Vogt weaves a compelling story, crafted with just enough flashbacks to give you a sense of Logan and Vanessa’s history, as well as pulls you into the heart of their conflicted, emotional circumstances. The spiritual journey of both characters gave me plenty to mull even after the last page was turned. No spoilers here, but there’s an amazing scene at the end of the novel that is just a beautiful picture of the covenant relationship our Lord offers his children. I’m intrigued with the premise of a destination wedding series and I look forward to more from this talented author. Well done! Thank you to the author and the publisher for providing a complimentary copy of the novel. The opinions expressed in this review are my own. Giveaway: Click here for all the details on how you can enter Beth Vogt’s Beach Bag Giveaway with prize pack valued at more than $200. Sounds like a terrific premise for a story (and a series)! The title alone makes it sound like a fun book to read – thanks for letting us know about it! Wow, this sounds like a great story! I love it when an author backs characters into a corner like this. Looking forward to reading it.